AluWadi or Patra or Patrado is a roll made of Arum/Colocasia/Taro root leaves. Since Arum leaves are not available here, I had experimented making rolls with mustard leaves, lettuce leaves and collard greens. I found Collard Greens taste the best. Aluchi Wadi in Marathi, Patra in Gujarati and Patrado in Konkani. Coarsely grind the coriander seeds. In a mixing bowl, add gram flour, ground coriander, grated jaggery, tamarind, turmeric, Cayenne pepper and salt. Mix all the ingredients well and make a paste with water. The consistency is slightly thicker than pakoda/bhajia batter, not too thin. You can add 1 tsp white sesame seeds/til in this batter as well. For Arum leaves, add more tamarind to avoid itching sensation. Add Cayenne pepper to suit your taste. Wash the leaves well and remove the thick midribs of the leaves. Wipe the leaves with a clean cloth. Place a leaf with the lighter green side up and apply the gram flour paste evenly. Place 4 - 5 leaves, applying paste in a similar way. Fold the leaves together from all the 4 sides and form a roll. Steam these rolls for about 12 - 15 minutes. After the rolls cool, cut the rolls into medium slices and shallow fry the slices in a pan with little oil until crisp. You can coat the slices in rava/sooji/semolina and deep fry or shallow fry them. Serve Aluchi Vadi with dal rice or as an appetizer. Thats a delicious and tempting alu wadi, yet to try this at home..Havent saw this leaves here, will go for search..fantastic work Uma.. These are my hubbys favourite.I sometimes make these with large spinach laeves as I cant get colocasia leaves. we call it PATRA! I've posted on my blog too sometimes back..my DD's fav...love your step by step pics..
really interesting recipe.very new dish to me..taroo root is our favorite one..especially mine. wrap looks delicious.i like the detailed presentation..
Lovely! I think thats a great feat you achieved rolling and steaming them. Fantastic! Thanks Priya, Simply.Food, Madhura, Jagruti, Prani, Nostalgia, Sathya, Sushma, Premalatha, Abhi for the lovely comments. Thanks Madhura and Prani for the awards. First time here. Fantastic collection of healthy recipes you have. Happy to follow u. Do drop in at my blog sometime. Thanks for stopping by Jay and I appreciate your comment. Thanks Panchpakwan, Krishnaveni for stopping by. Krishnaveni, do give it a try and let me know how it turned out. 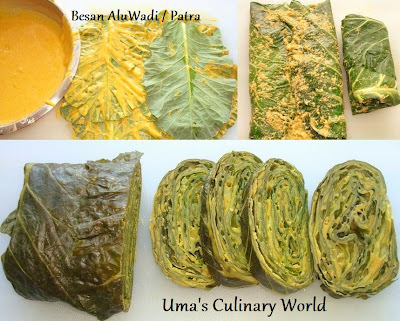 Loved the idea of using collard greens to make alu wadi, it looks fabulous ! Thanks Preeti and Usha for the sweet comments!